Inventory for a merchandising business consists of the goods available for resale to customers. However, retailers are not the only businesses that maintain inventory. Manufacturers also have inventories related to the goods they produce. Goods completed and awaiting sale are termed “finished goods” inventory. A manufacturer may also have “work in process” inventory consisting of goods being manufactured but not yet completed. And, a third category of inventory is “raw material,” consisting of goods to be used in the manufacture of products. Inventories are typically classified as current assets on the balance sheet. Managerial accounting courses cover the specifics of accounting for manufactured inventory. This book will focus on the general principles of inventory accounting that are applicable to most enterprises. Recall from the merchandising chapter the discussion of freight charges. In that chapter, F.O.B. terms were introduced, and the focus was on which party would bear the cost of freight. But, F.O.B. terms also determine when goods are (or are not) included in inventory. Technically, goods in transit belong to the party holding legal ownership. Ownership depends on the F.O.B. terms. Goods sold F.O.B. destination do not belong to the purchaser until they arrive at their final destination. Goods sold F.O.B. shipping point become property of the purchaser once shipped by the seller. Therefore, when determining the amount of inventory owned at year end, goods in transit must be considered in light of the F.O.B. terms. In the case of F.O.B. shipping point, for instance, a buyer would need to include as inventory the goods that are being transported but not yet received. 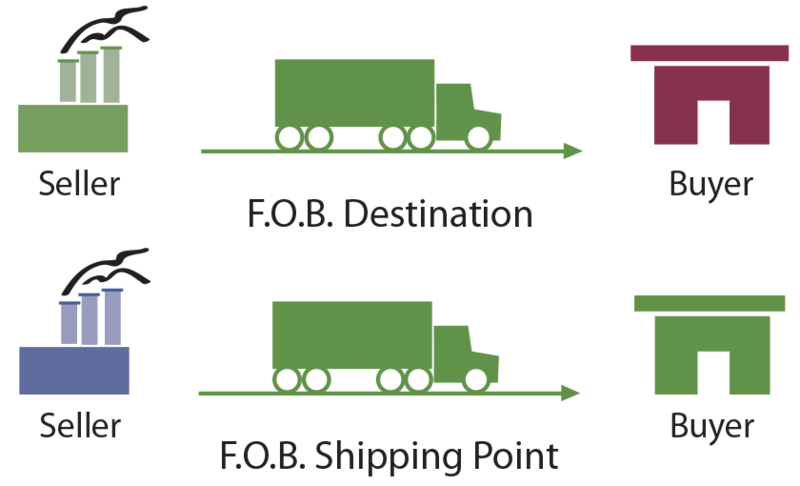 In the diagram, the buyer or seller shown in green would “inventory” the goods in transit. Another inventory-related problem area pertains to goods on consignment. Consigned goods describe products that are in the physical custody of one party, but actually belong to another party. Thus, the party holding physical possession is not the legal owner. The person with physical possession is known as the consignee. The consignee is responsible for taking care of the goods and trying to sell them to an end customer. The consignor is the party holding legal ownership/title to the consigned goods. 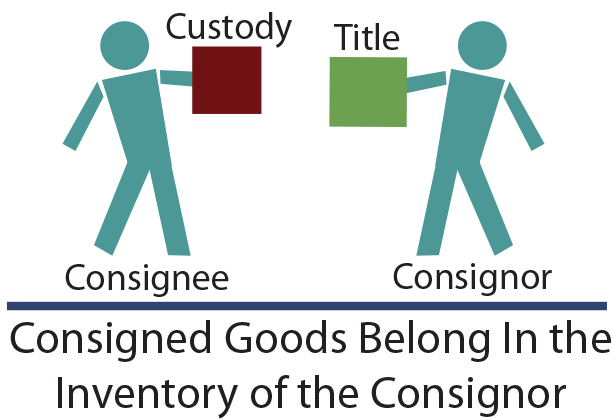 Consigned goods should be included in the inventory of the consignor. Consignments arise when the owner desires to place inventory in the hands of a sales agent, but the sales agent does not want to pay for those goods unless resold to an end customer. For example, auto parts manufacturers produce many types of parts that are very specialized and expensive. A retail auto parts store may not be able to afford to stock every variety. In addition, there is the real risk of ending up with numerous obsolete units. But, the manufacturer desperately needs these units in the retail channel. As a result, the parts manufacturer may consign their inventory to auto parts retailers. Conceptually, it is fairly simple to understand the accounting for consigned goods. Practically, there is a significant record keeping challenge. When examining a company’s inventory on hand, special care must be taken to identify both goods consigned out to others (which are to be included in inventory) and goods consigned in (which are not to be included in inventory). When the consignee sells consigned goods to an end user, the consignee would keep a portion of the sales price, and remit the balance to the consignor. All of this activity requires an accounting system capable of identifying consigned units, tracking their movement, and knowing when they are actually sold. Identify three basic categories of inventory, and know where inventory is reported on the balance sheet. What is meant by the term “F.O.B.”? How are goods in transit classified on the financial statements? How are goods on consignment classified on the financial statements?